Every effort should be made to moderate the grade (steepness) of walkways. Guidelines for complying with the ADA (Americans with Disabilities Act) recommend that a sidewalk grade should not exceed 5%, except over short distances such as curb ramps. 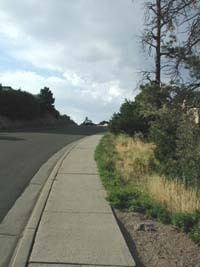 A sidewalk as steep as the one shown will be a barrier not only to the disabled, but to many "able-bodied" individuals as well. In some cases the topography of the land prevents meeting this requirement. But if it is taken into account when a sidewalk is being designed. the surface can often be regraded, or the walkway rerouted, to reduce the grade.